There is a natural way to compute the curvature for a curve whose position is given as a function of time, . The following is the vector proof which shows how the velocity and acceleration vectors can be used to compute the curvature at any time. Is there a natural way to describe the curvature of a function without using the parametric form? For example, suppose a curve is the consequence of the intersection of three volumes defined using an extended Cartesian system with four coordinates: . So, , and we wish to know the curvature at . This is a well-defined question with no reference to a parameter, . It is natural to wonder whether there is a way to find curvature without imposing a new parameter. My initial thoughts are that we can still define the differential arc length in this approach ; however, at the point , one’s movement is restricted by the requirement that . So the differential arc length and the unit tangent vector will reflect this in the solution. Help me out. 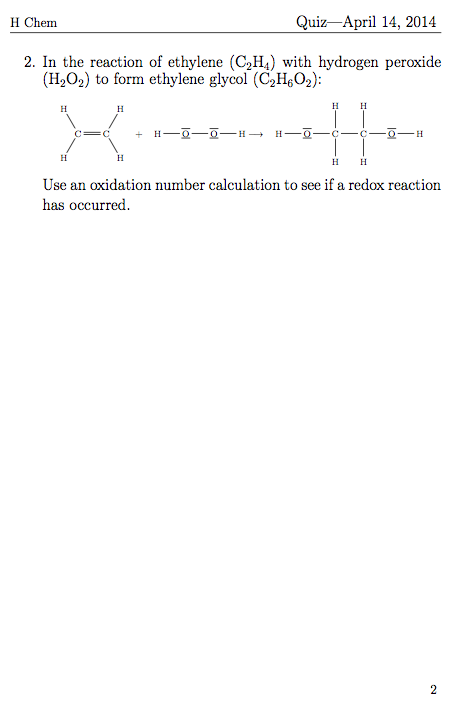 Add a solution route in a comment below if you have a solution. I have a compact form for the tangent vector, but I haven’t found a method to get the curvature yet. We started a unit this week applying equilibrium concepts to acid base chemistry. To motivate this discussion, we used prompts to engage students in the critical thinking skills of problem solving and lab design. Apple juice and vinegar were chosen as easy to engage weak acid systems. Acid strength and a relative danger is a common area for students to be confused about and this lab will allow for many opportunities to answer the question (are acids dangerous?) too. 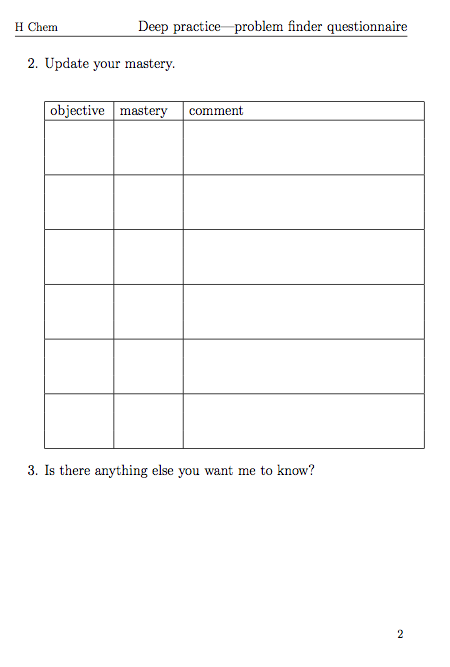 The first prompt engages students in the relationship between , and weak and strong acids. The second prompt engages students in the relationship between these variables as well, but they will need to invent the science needed to get an extra unknown variable (in this case ). I guide students through thinking at the end of the lab about the utility of doing a titration and finding the at the half-equivalence point. Students figure out that they need to know the concentration of acetic acid in vinegar. While they can get a measurement of the concentration using the pH meter, if they do not know the initial concentration of the vinegar in the water, this will throw off their calculation. So how can we measure the amount of acetic acid and ? With a titration, and a pH measurement, we can find the equivalence point by seeking a place on the titration curve with a vertical asymptote. Using the amount of base added and the pH at the equivalence point, we can see both how much base was needed AND the amount of counter ion present at the equivalence point. A HINT to use: What will the pH be at the equivalence point of a titration of acetic acid…. As a teacher, I confess that I don’t have an answer, but unless students spend a significant portion of the class time honing rare and valuable skills, I suspect that we are not worth the opportunity cost our students are paying. Just how steep is this opportunity cost? Let’s assume that 10,000 hours is necessary to achieve expert status in a given field. * We can now calculate that a particular class consumes 1.5% of this number. Unless students are doing something that is truly rare, “rare and valuable” expertise can not be cultivated. Note: the average class is not doing this by the definitions of “rare” and “average”. This year, students have used our class’s democratic process to pass a motion allocating one period every week to their independent project work. They set up a blog** that is uniquely their own where they investigate a host of topics from the nature of glow in the dark materials to the philosophy of science. They are testing soil quality at our organic garden and doing many other projects they care about. Students have shared their demos, experiments, and essays with each other and the world. This work has been a vehicle through which they have honed many skills, including the problem-finding and problem-solving skills people value. I want to end with a few reflections. First, I don’t think I am rare. I am just like every other teacher who is trying to figure out what I should do in my classroom each day. But, over my four years as a teacher, the value proposition I offer has changed. 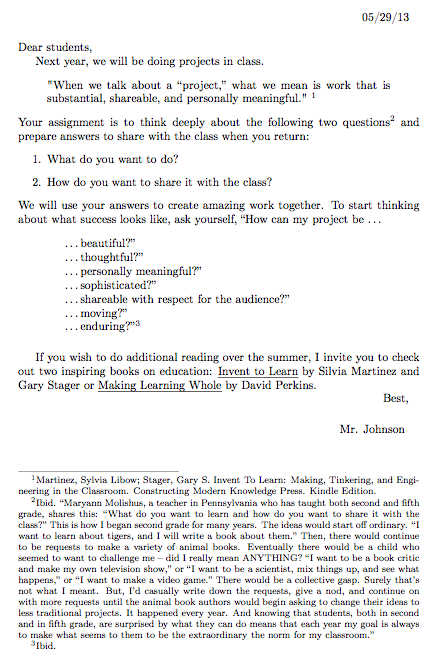 When I began, I naïvely thought that my students would be experts in my field after a year with me. Today, I know that they only pass this test if I narrowly define the words “expert” and “field”. Regarding the new discipline-specific skills, students are just beginning their mastery journey. This 1.5% represents the window I have to hook or sour them on a new pursuit. By opening up our classrooms to develop skills in concert, students tailor their education: simultaneously learning new skills and adding 1.5% to skills that were already in progress before they met me. 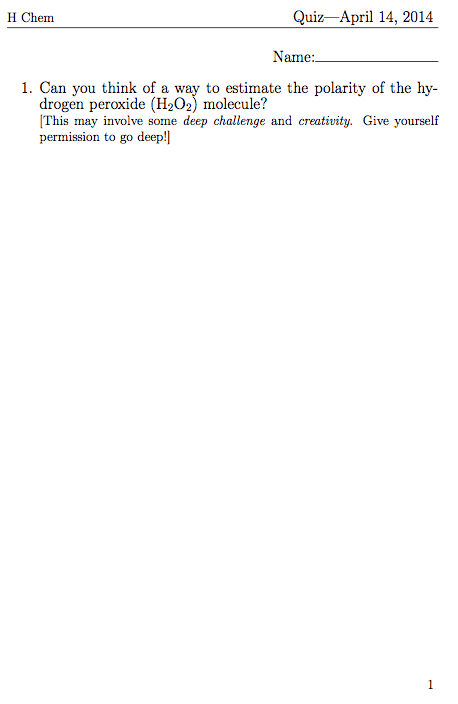 * Read this beautiful essay about expertise (PDF) by Ericsson, Prietula, and Cokely for more on this. ** No, I can’t take credit for the URL choice “onedirectionkateupton.wordpress.com” or the motto: “Come for the Celebrities, Stay for the Chemistry” both of which were chosen democratically to increase google search traffic to their site. *** One last thought: I want to challenge the implicit notion that a student is primarily a recipient of—and secondary to—the knowledge within a field. When teachers make course decisions ahead of time, or without asking, students inevitably receive the message that the institution or the teacher knows best which rare and valuable skills they should master. I am willing to be convinced of this if student outcomes warrant it, but I refuse to accept it uncritically since the cost of the bargain is at least a measure of student autonomy—the first of Dan Pink’s motivation triumvirate. 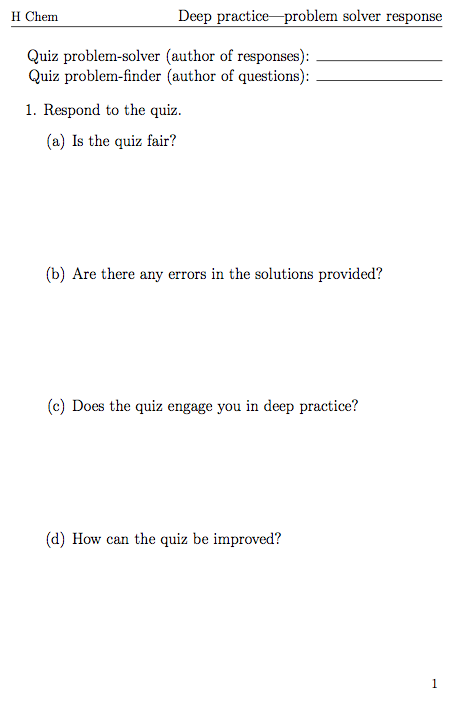 I have been using ridiculously challenging (and interesting) chemistry questions for my 1st year chemistry class. 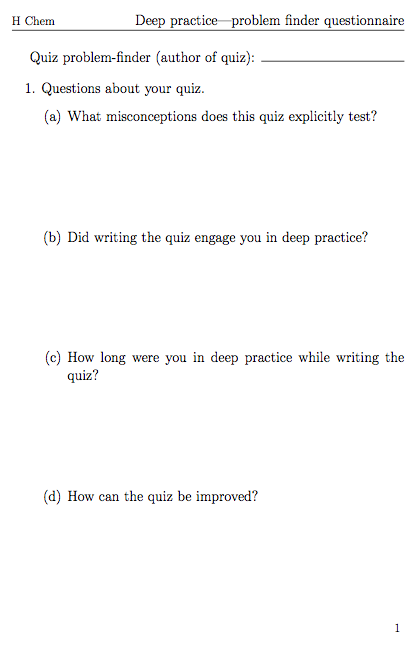 To the extent that I have made the questions harder and had students focus on deep practice (as opposed to grades), I have found that students enjoy the quizzes more. Here is the quiz for today. After such a quiz, I have students compare their work with a solution key. They then identify areas where they can push themselves further. Here is a questionnaire they complete. The goal is that they will be able to write their own gnarly, challenging problem sets and solution key. 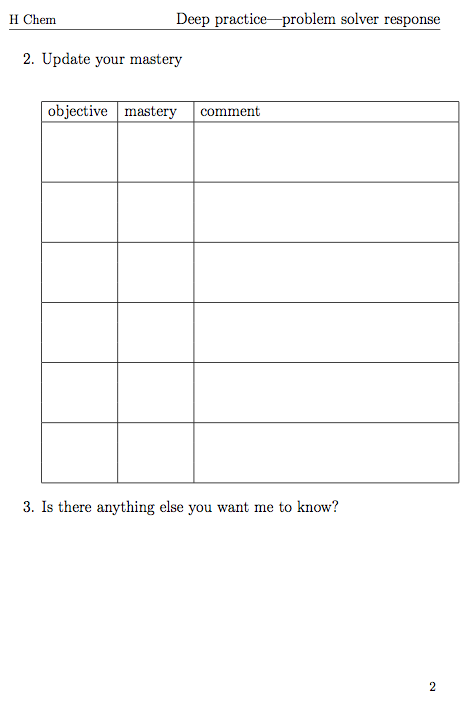 Here is a questionnaire that guides them through that process. I hope that students in my course define their own interests and objectives, and as they write their own interesting questions for their peers, they will render me obsolete.